Earlier this year, a Germanwings jet carrying 150 people crashed into a remote area of the French Alps, killing everyone on board. Authorities say co-pilot Andreas Lubitz, who had suffered from suicidal tendencies and depression, intentionally crashed the Barcelona-Dusseldorf flight but they are still puzzling over why he did it. Scientists from France, the US and Japan are now working together to better understand how a pilot’s brain functions. The Germanwings accident was a unique case, so scientists have extended their research to understand pilots’ physiological and neurological reactions to stress, with the aim of being able to identify the signals that precede potential error in order to prevent it. 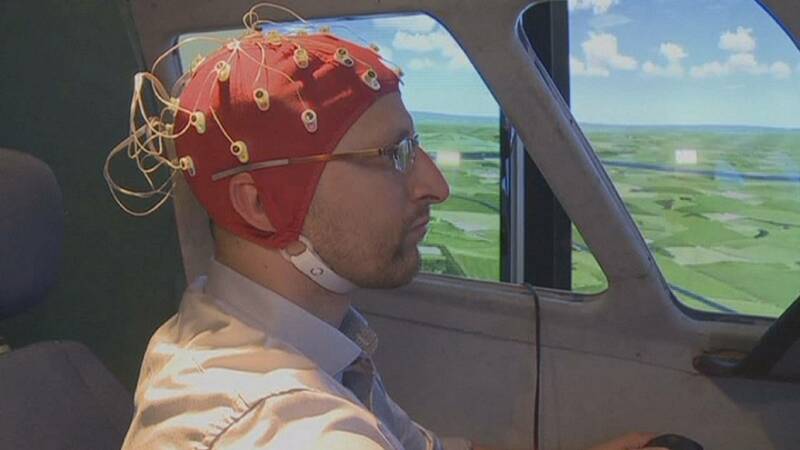 “We are trying to better understand what can cause human error by using the same tools as neuroscientists, like electro-encephalography, measuring the heart rate, perspiration, the pupil diametre, eye tracking, which means tracking the pilot’s gaze at any given moment,” explains Mickael Causse, assistant professor at the Aeronautical and Space Institute (ISAESUPAERO) in Toulouse. Pupil dilation is a reliable external indicator of mental stress, according to Dehais. The scientists can watch as a highly stressed pilot’s brain literally shuts down many of its critical faculties and shifts from rational decision to emotional reaction, to a state of so-called “inattentional deafness”, where audible alarms and spoken instructions are ignored. Since the Germanwings crash last March, pilots’ behaviour has been under scrunity. However, researchers believe we are still a long way from switching to completely automatic, pilotless planes or even planes with just one pilot onboard. “First of all, there is a psychological barrier – are passengers prepared to board an aircraft without a pilot? For now I would say that’s a no. Having just one pilot on board, unfortunately we saw what happened with the Germanwings (crash), that can be a problem. So I think, there will still be two pilots inside the cockpit for a while to come,” says Mickael Causse. The potential of this research goes further as it could also be used during the pilot selection process and for monitoring the effectiveness of training techniques and cockpit designs. And it could even be applied to others working in high stress jobs, like surgeons, or for people working in nuclear power control.